What a fabulous day of raw food cooking at the Raw Food Cooking School! From Bircher muesli for breakfast, zucchini pasta for lunch to Nori rolls for dinner… the day was jam packed with exciting recipes that all taste great and work well! I can’t wait to share all the recipes! Blend 1/4 cauliflower at a time with 1/2 cashews. Process all cashews and cauliflower until smooth. This will form the ‘rice’. This mixture should be slightly crumbly like rice. Lay a nori sheet, shiny side down on a chopping board. 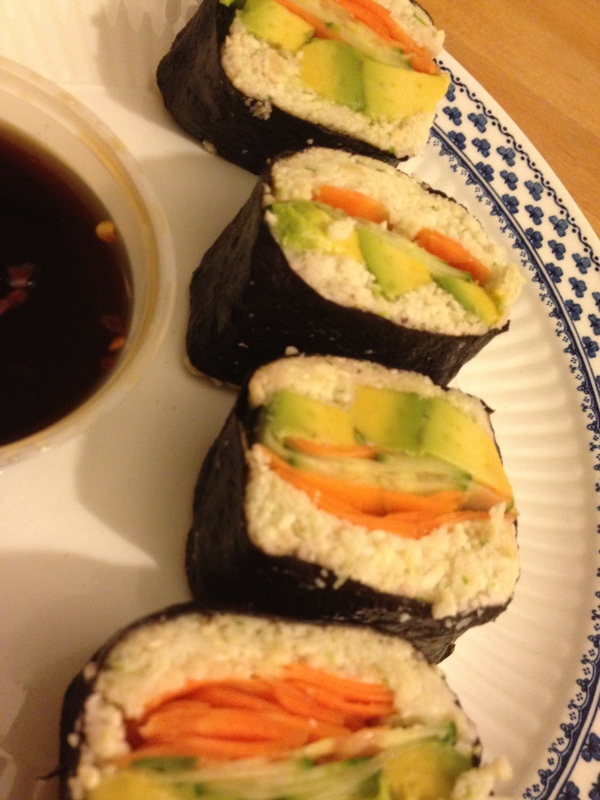 Spread the cauliflower – cashew mixture into a 1 1/2 inch thick strip onto the nori about 2 inches from the edge of your nori sheet as you would for making sushi, add the carrot, cucumber and avocado and finish with layer of the cashew mixture. Wet the far edge of the nori sheet with water and roll the nori sheet into a nori roll. Place edge side down and allow to sit for 10 minutes before slicing into 5-6 nori pieces. Combine together 2 Tbsp. agave nectar, 4 Tbsp. Tamari, 1 Tbsp. rice wine vinegar and 1 Tsp. chilli flakes. These taste absolutely great and very filling. They really are best eaten fresh on the day they are made – but could keep in the fridge for a night. Thanks Karen Bartz – for a really awesome recipe that I even think I could get my kids to eat!